At Saco River Dentistry, we understand how important a smile can be. A healthy, welcoming grin expresses happiness, openness, and connection. However, if you’re uncomfortable with the appearance or function of your teeth, you may avoid smiling or experience feelings of self-consciousness when opening your mouth. Damage, decay, staining, and other dental concerns are very common—but that doesn’t mean you have to live with them. At our practice, we offer cosmetic dental veneers that can effectively address a wide range of issues with exceptional, natural-looking results. Our experienced cosmetic dentists are committed to helping you achieve the smile you’ve always dreamed of. 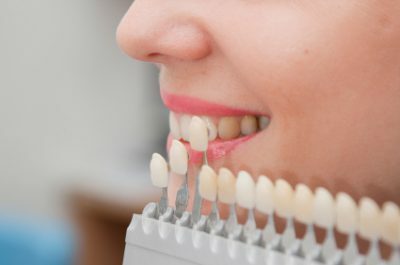 Dental veneers are thin shells or caps that can be placed on top of the existing teeth to conceal cosmetic imperfections such as staining or cracks. We use porcelain veneers, the most sought-after choice, because porcelain is a highly durable material that can be personalized to match the translucency and beauty of your natural tooth enamel. We also utilize the latest techniques, which make it possible to shape your teeth with minimal filing for a stronger and more natural-looking outcome. Each veneer is custom-made, and they are designed to be very long-lasting. Our patients love porcelain veneers because they are very resistant to staining and tough enough for real life. As a result, your smile should be brighter, more aesthetically appealing, and stronger than before treatment. Porcelain veneers and dental crowns are typically used for different purposes, but in some cases patients may have a choice between the two treatments. Porcelain veneers are more commonly used for cosmetic enhancement, to improve the appearance of the smile when aesthetic issues, rather than functional ones, cause concern. Dental crowns are the opposite. They are usually recommended to strengthen damaged teeth, to cap a tooth after a root canal, or to top off a dental implant. That said, porcelain veneers require less aggressive modification of the tooth. Therefore, if a tooth is only lightly damaged, it may make sense to use a porcelain veneer rather than a dental crown. During your initial consultation, our dentists will go over all of your options and help you select the right approach for you. What Should I Expect From the Veneers Procedure? When you arrive at our practice, one of our dentists will evaluate your oral structures, discuss your concerns, and develop a customized treatment plan based on your goals. We’re here to help you make the best decision for your needs and desired result, and we will never upsell or push a procedure you don’t need. When it comes to technology, our office is state-of-the-art. When it comes to service, we proudly maintain a small town approach. We believe going to the dentist should be a pleasant experience, and we will provide attentive, personalized care at every stage of the process. At your initial consultation, you’re encouraged to talk to us about what you like and dislike about your smile, ask questions, and collaborate on your treatment plan. We will show you images from our dental treatment before-and-after gallery so you can get an idea of what can be accomplished. The first step will involve preparing (gently reshaping) your teeth and taking a mold. This model will be used to guide the creation of the porcelain veneers for the most precise fit possible. During the second appointment, your teeth will be cleaned, and then each customized veneer will be individually affixed to the tooth’s surface using cement bonding. Veneers are color-tinted to match your existing teeth or to suit your needs and preferences. We make every effort to give you a pleasant and comfortable experience, and most patients report little to no discomfort. One of the best features of cosmetic veneers is the easy maintenance. You should care for your new smile the same as you would your natural teeth—with regular brushing, flossing, and dental checkups. At Saco River Dentistry, we want you to feel confident in your smile. And our advanced techniques, technology, and materials are designed to give you an outcome you can be proud to show off. Two primary factors will affect how long your porcelain veneers will last: the quality of the cosmetic dentist you choose to perform the procedure, and how well you care for your veneers. Our dentists are extensively trained in the latest techniques and use the highest-quality materials. As for home maintenance, you should brush and floss daily as you would normally, and visit the dentist regularly for cleanings and checkups. Many individuals who follow these guidelines are able to enjoy their veneers for decades. The price of porcelain veneers will depend on the number of veneers you have placed and the complexity of your treatment. We understand that cost can be a very important factor in your decision-making process, and we will provide a detailed explanation of the total cost of your program during your initial consultation. As a convenience to our patients, we offer a range of dental financing options in addition to working with most dental insurance companies. We want you to feel comfortable, confident, and excited about your procedure, so please don’t hesitate to ask any questions or voice concerns that may arise. We are here to help. For more information about dental veneers, or to schedule a consultation with one of our Saco Dentistry doctors, please contact us online or call (207) 929-3900 today.